Join us for the 16th Annual “Tour de Lopez”. This is a great family event - come for the day or come for the weekend. 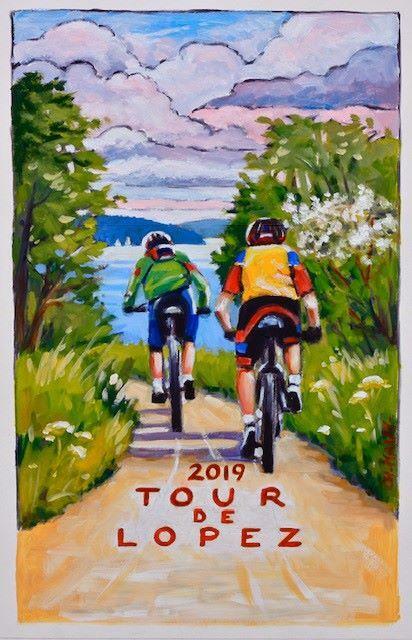 It's a non-competitive rural road tour with marked short and long routes (3.1, 5, 10, 18 and 31 miles), on public county roads through the scenic landscape of Lopez. Registration includes the Saturday ride, 3 refueling rest areas with yummy treats, a wonderful BBQ lunch, live music and a beer garden. Be sure to register early as this is a sell-out event with limited registration. The tour routes are marked with our unique recycled bicycles - designated rest areas have water and restrooms. The lunch is served from 11:30am-2:30pm at Lopez Center for Community and the Arts. For those on a day trip, the ride back to the ferry landing is about 4.5 miles from the Village. If you come a day or two early be sure to come to the 6th Annual Bite of Lopez Friday evening - early check-in is available at the Bite. Are there ID or minimum age requirements to enter the event? No minimum age - the whole family is welcome. Participants under 18 will need their waiver signed by a parent or guardian. What's the refund policy? Life gets in the way of even the best laid plans. Refunds are available up to April 10th in the event if you have to cancel because of a change of plans, illness or injury. However, this event goes on rain or shine. There are no refunds due to weather. Cancellation insurance is available for a limited time after date of registration if you register on-line through Events.com. How do I get to Lopez? Washington State Ferries is the place to start. Reservations for ferry travel are recommended for this event. Reservation space is released in tiers. Two months before the start of the season, one-third of reservations for all sailings for the entire season are released. Two weeks before any sailing date another one-third is released, and two days before any sailing date the final one-third is released. A total of 90 percent of vehicle spaces on each sailing will be available for reservations. Space is always released at 7:00am. The spring schedule begins March 31, so spots will first become available January 31. More spots then become available 2 Weeks and 2 Days advance of your date of travel. That means additional spaces for April 27 will become available April 13, and April 25 at 7:00am. There are no reservations available for departing Lopez Island.